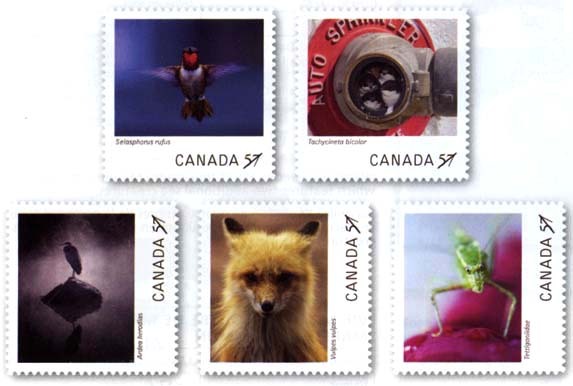 On May 22nd, 2010, Canada Post began issuing a series of 5 stamps featuring some of the winners of the Canadian Geographic Wildlife Photography Contest for 2009. The stamps feature images from photos submitted to various categories of the contest. They highlight our country’s biodiversity and, simply, are beautiful to look at. Canadian Geographic is celebrating its 80th anniversary; how better than with a national stamp spread? Katydid-«What’s up dude?»….this colourful insect was photographed by Julie Bazinet of Gatineau.